The electoral college does not makes sense any more and the only reason republicans are super desperate to keep it because they would rarely win elections with the popular vote. It's dumb. The electoral college assures that people's votes do not count unless they are in swing states. If you live in a blue/red state, you might as well not bother voting. It's no surprise that half the country doesn't vote. A popular vote for president of the entire country makes sense to count every individual vote as an individual vote, not to water it down based on the size of the land mass in a state. That way people actually have the power instead of land mass. I can't believe anybody would actually support keeping the electoral college. It is the single biggest problem with our election system. LMAO at comparing that to mob rule. It only applies to electing 2 people. What a joke. It doesn't suddenly turn policy making into mob rule. Slippery slope fallacy as always. Conservatives live off that fallacy. Even in the EC the deck is slanted in favor of the people that promise everything for free in the high population density areas... The only reason trump won was the Hillary campaign was one of the worst run in my life time. Lastly you claim its not fair and people in high density population areas votes aren't counted, or don't count... yet go straight democratic vote and every body that doesn't live in those areas will never have their vote count, how is that fair? The EC is still working as intended, if Hillary runs a decent campaign she wins in a walk, if you cant comprehend that I dont know what to tell you. 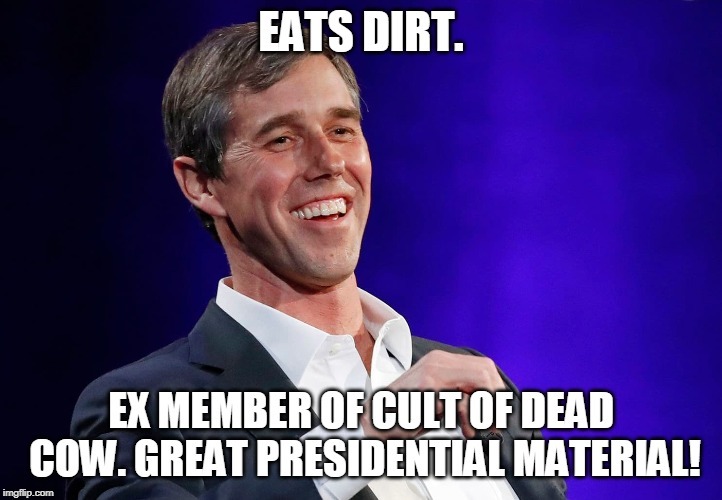 Edit: As far as Beto... just another clown running for the fringe to line his pockets. And yet it's not republicans trying to get rid of it. When it comes to picking the president and vice president? The sheer amount of power they have. The majority of Americans are dumb snips. You don't get that since the 1700's, the normal citizens of this country haven't wanted the biggest state(s) deciding the election for everybody? Without CA, Trump wins the popular vote in 49 states. What kind of sense would it make to let CA be the deciding factor in our elections? That's the entire purpose behind the electoral vote and why the founding fathers wrote it in. That was back when a 13 year old boy had more backbone and less fear than a 40 year old man today. Nationwide "Popular" Vote makes it easier for Democrats to steal elections. 2016 saw the biggest turnout in voting history. Try again. Republicans are desperate to uphold the constitution of the United States of America? You don't say! If we went by the popular vote then the vote of people in 49 other states wouldn't have counted in the last election. You want to silence the vote of the people in 49 states just to benefit the outcome you didn't get. You can disguise that as "every vote would count" but nobody else is stupid enough to buy the BS you're selling. Lemme guess, you're a green new deal supporter. See you keep looking at this from a "state" perspective, and thats the disconnect. The divide in this country used to be closer to riding state lines. It isnt like that anymore, the times and our population has changed. The political divide in this country is Urban vs Rural no matter where you live. Conservatives and GOP members here seem to keep repeating "It would be California vs ruling the rest of the country"
Thats not really the case at all... yes California has a massive population and yes they are pretty Left wing.. but.. then again.. they have voted for republican governors no?